With elegant simplicity, Dr. Bob Nelson, an employee engagement specialist, brings the top 10 most important ways to motivate today’s employees to life in a slide show format. We hope you will enjoy it as much as we did but if you really just want the nuts and bolts, we have transcribed it for you below. The important thing to remember is workers may not need a pay raise as much as a personal thank you from their manager for a job well done. 1. Personally thank employees for doing a good job. Personal thanks, face-to-face, in writing, or both can be incredibly rewarding for employees. Do it in a timely fashion, often and sincerely. 2. Give your time. Be willing to meet with and listen to employees - as much as they need or want. 3. Give feedback about the performance of the person, the department and the organization. 4. Have fun. Strive to create a work environment that is open, trusting and fun. Encourage new ideas and initiative. 5. Be transparent. Provide information on how the company makes and loses money, upcoming products and strategies for competing in the marketplace, and how the person fits into the overall plan. 6. Involve employees in decisions. Involve employees in decisions, especially as those decisions affect them. 7. Give ownership. 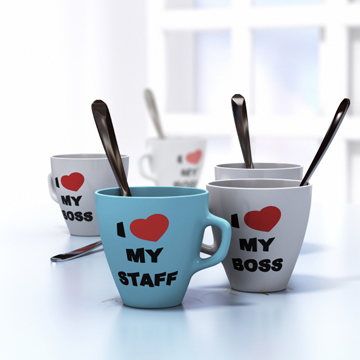 Provide employees with a sense of ownership in their work and the work environment. 8. Recognize, reward and promote people. Recognize, reward and promote people based on their performance. Deal with low and marginal performers so that they improve or leave. 9. Create a partnership with each employee. Give people a chance to grow and learn new skills. Show them how you can help them meet their goals within the context of meeting the organization’s goals. 10. Celebrate successes. Celebrate the successes of the company, of the department and of the individuals in it. Take time for team and morale building meetings and activities.